Rob Day has experience writing for Ringnews24, Boxrec and he has written for boxing magazine, Bocsio. Rob covers boxing in the South of Wales. He can be found occasionally as a guest on boxing radio shows. Rhydycar Leisure Centre, Merthyr Tydfil, Wales was the setting for the Sanigar Events promotion ‘Welsh Pride’, with Frankie Borg defending his Welsh middleweight title against local fighter and favourite Kerry Hope. It was Cardiffian Frankie Borg who upset the odds, as he triumphed in a closely fought bout over ten rounds. In the early rounds the better work was coming from Frankie, as he landed eye-catching left hooks and displayed good body work. Hope took a few rounds to find his rhythm, and while he showed some decent straight one-two’s he was losing the inside battle. Several rounds were close, though for me it was Borg landing the cleaner, heavier shots and he displayed a tight guard that Hope was struggling to penetrate with any regularity. The Merthyr boxer had good spells, when boxing and moving, but it was the champion that rightly got the nod from referee Clarke Joslyn by 97-95. It was the first time that he’d been the full ten rounds and the 33-year-old was a deserved winner on my card by 96-94. Frankie Borg, trained by uncle Tony Borg, was back to winning ways after a stoppage defeat to Chris Eubank Jr, at the end of 2013, ironically Kerry Hope had been announced as Eubank’s next opponent though it remains to be seen whether that will now take place. The win gets Frankie back on track and it will take some performance to take that Welsh title from him, as it is evident that he is not going to give it away lightly. It’s great to see such a historic belt being fought for regularly and with grit and passion. 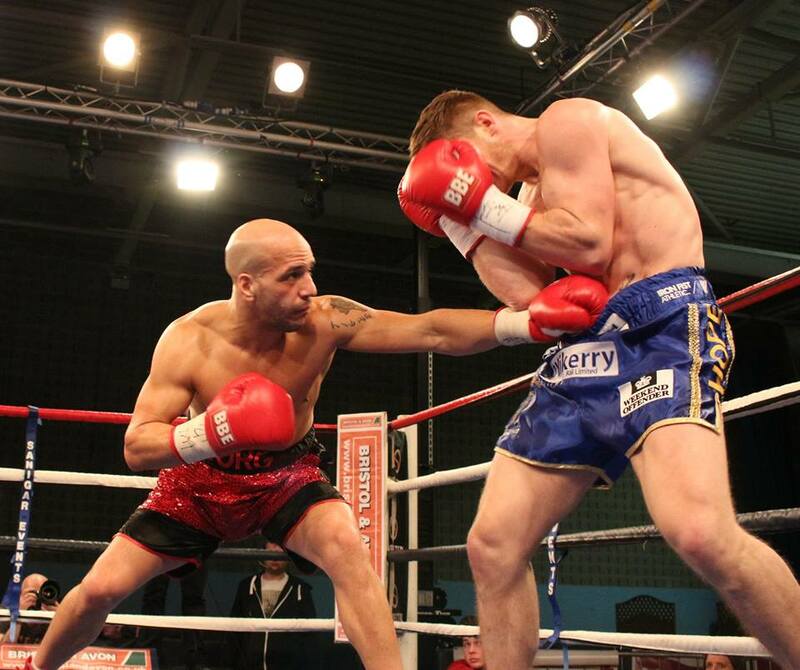 Welsh champion Frankie Borg’s record is now 9-2, while Kerry Hope’s drops to 20-7. Chris Jenkins opened his contest looking sharp, quick and purposeful; as he made fast work of Bulgarian Asan Yuseinov. Swansea’s Jenkins got through with his potent left-hook to the body, dropping Yuseinov who was counted out by referee Clarke Joslyn. Both fighters weighed in above the light-welterweight limit and it was a good keep busy fight for the 25-year-old, who is looking to be out next on the May 17th, Matchroom bill in Cardiff. Jenkin’s had been making the trip to St.Joseph’s gym in Newport, for quality sparring, and the benefit was there for all to see, as he made light-work of his Bulgarian foe. Chris ‘Rok’n’Rolla’ Jenkins remains unbeaten at 14-0, while Asan Yuseinov’s record falls to13-8-2. The evening saw the return of the popular super featherweight Robbie Turley, who took on Michael ‘Trouble Maker’ Ramabeletsa of South Africa over six rounds. Turley hadn’t been in a ring since the 2nd March, 2012 due to his licence being revoked when their was an irregularity with a brain scan. After seeing specialists and going through appeals, Robbie was allowed to box again by the BBBoC after being medically given the all clear to box again. Understandably there were signs of rust, and Ramabeletsa was tricky and cagey, with-out being overly threatening. The ‘Trouble Maker’ was certainly looking to spring an upset and spoil the comeback party. Both looked to pick their shots and traded jabs – in the third the visitor was cut over the right-eye and it was ruled as by a punch. Turley finished the second half of the contest strongly and was the worthy winner on referee Reece Carters card 59-57. Robbie Turley’s record improves to 12-4 while Michael Ramabeletsa is now 11-12. Newport’s Adam Goldsmith having his first fight since December 2012, got a hard-fought decision over Lewis van Poetsch in a four round welterweight contest. ‘Poochi’ landed good counter rights, in the contest but overall it was the quicker hands and busier work from Goldsmith that won the rounds. Lydney’s Van Poetsch stood-off abit too much rather than pushing the action. Goldsmith understandably lacked a bit of sharpness but showed some good combinations and straight right hands. Referee Clarke Joslyn scored it 39-38 in Goldsmith’s favour to rightly declare him the winner. Adam Goldsmith’s record is now 2-0-1 while Lewis van Poetsch’s record falls to 3-9. In a heavyweight contest Bristol’s Henry Smith returned to the ring after a five year absence, to pound out a four round points decision over Courtney Richards of Plymouth. The 21-year-old Richards pushed Smith all the way but suffered heavy bleeding from the nose, in the second, and while he had his moments, it was the heavier Smith who was slightly busier. Referee Reece Carter had it 39-38 for Smith. 35-year-old Henry Smith’s record is now 3-3 while Courtney Richard’s record drops to 2-3-1. The show opener was a super featherweight rematch between Ben Moorish and Harvey Hemsley, the two fought to a draw in January in Bristol but this time Plymouth’s Moorish came-out on top over four rounds. Moorish was more purposeful from the start and landed impressive uppercuts through-out the bout and overall controlled the action. Bristol’s Hemsley was often beaten to the punch and referee Reece Carter saw it in Moorish’s favour 39-38. Ben Moorish record rises to 3-7-2 while Harvey Hemsley’s record is now 2-7-1.